From January 1 (2017), all the Dutch electric trains get 100% of their power via wind energy. Dutch electricity company Eneco won in 2015 a tender offered by NS (the Dutch National Railway Company) and the two companies signed a 10-year deal setting January 2018 as the date by which all NS trains should run on wind energy (the milestone was achieved a year ahead of schedule). Dutch wind turbines generate enough power to provide energy to 2.4 million Dutch homes. However, with 5,500 train trips daily, energy consumption for the train system come to about 1.2 billion kWh each year and wind energy is not only dedicated to trains, so the country does not have enough turbines to meet its needs. Half of this energy is generated in locally and the rest is bought from suppliers in Finland or Sweden, where the Eneco invested in the construction of new wind turbines. This investment guarantees that the imported electricity (by means of terrestrial or submarine cables) comes from wind mills instead of other non-renewable sources. 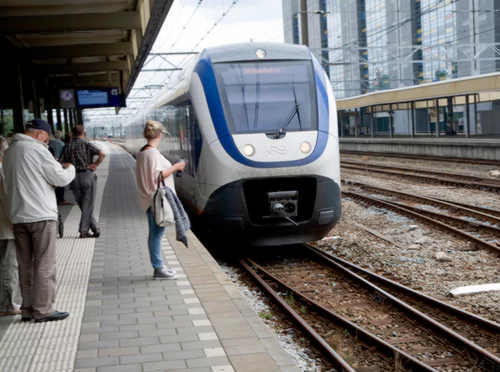 VIVENS -the partnership between NS and Eneco, wants to reduce energy use per passenger another 35% by 2020 when compared with figures from 2005.